panafoot: The Heat is on! 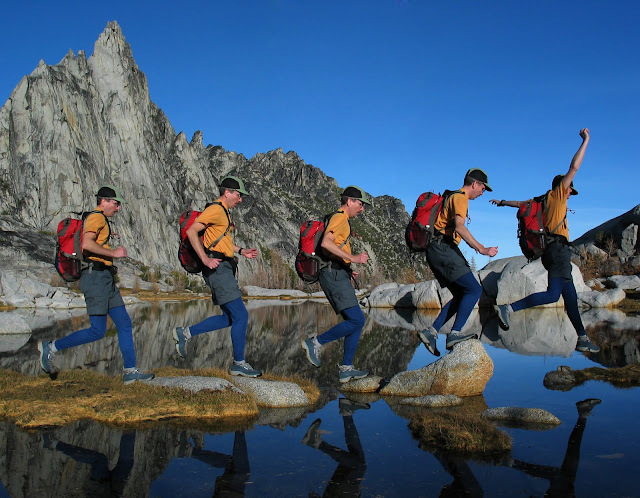 We need to think about doing some serious training for our upcoming John Muir Trail trip in August and plan to spend time in Colorado. However, there is still too much snow in the mountains so we decided to spend a bit more time in canyon country. We have visited southern Utah many times when our kids were little but it was always in April during their Spring Break from school. We have learned the hard way that there is a big difference in temperature between April and June. 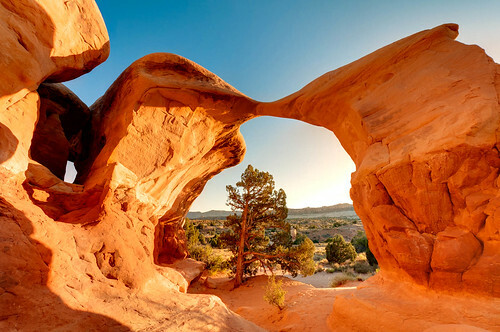 After catching up from our time in the Grand Canyon we headed to Grand Staircase – Escalante National Monument in Utah which contains numerous hiking opportunities. 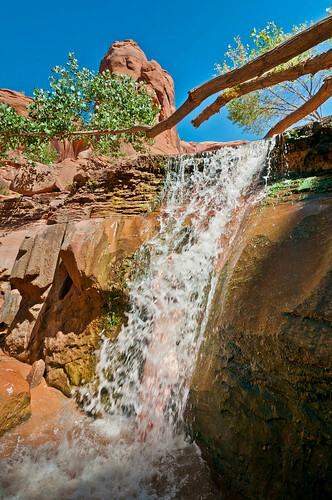 There is an excellent book, Non-Technical Canyon Hiking Guide to the Colorado Plateau by Michael Kelsey, recommended for anyone who wishes to explore the area. We drove down Hole-in-the-Rock Road where we found a great place to park our motorhome off the road, both private and scenic. We did a quick visit to Devil’s Garden which is like a sculpture garden containing a wide variety of sandstone “art”. We were there late in the day and John was only able to photograph a few of the features before the sun went down and focused his time on the most notable feature, Metate Arch. Our Devils Garden photos are on Flickr. 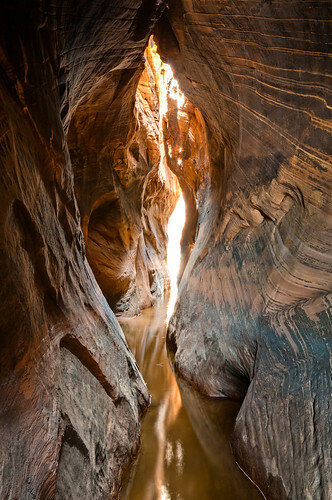 We also did a day hike to see two notable slot canyons in the area, Tunnel and Zebra. Access is from Upper Harris Wash and involves hiking through loose sand with little shade. The cool temperature in Tunnel Slot, a narrow, dark canyon, was welcomed and fortunately by this time of year some of the pools of water within were only mid thigh deep… but still quite cold. 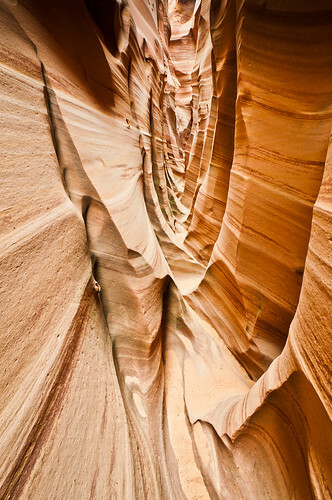 We then hiked the short distance to Zebra Canyon, named for the pink stripes in the sandstone. We had been led to have high expectations but were initially underwhelmed. As we have seen so much natural beauty in our travels we were concerned that we had become jaded. However, we only had to go in a bit farther to be blown away by the beauty of the inner canyon where the colors become more intense and the canyon is narrower with sharps edges of rock that zigzag repeatedly. We continued through the canyon until we encountered a boulder blocking the way. However John really wanted to see what was beyond it. 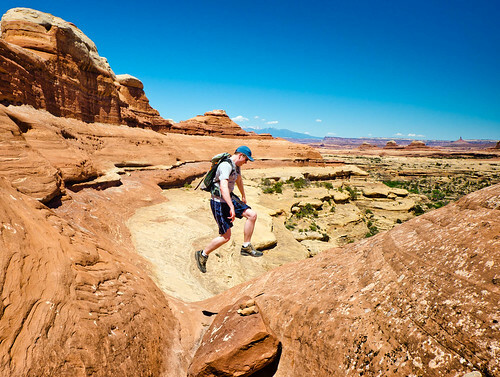 It required quite an effort on his part but he was able to finally get over the boulder and was rewarded with a completely different view of Zebra Canyon. 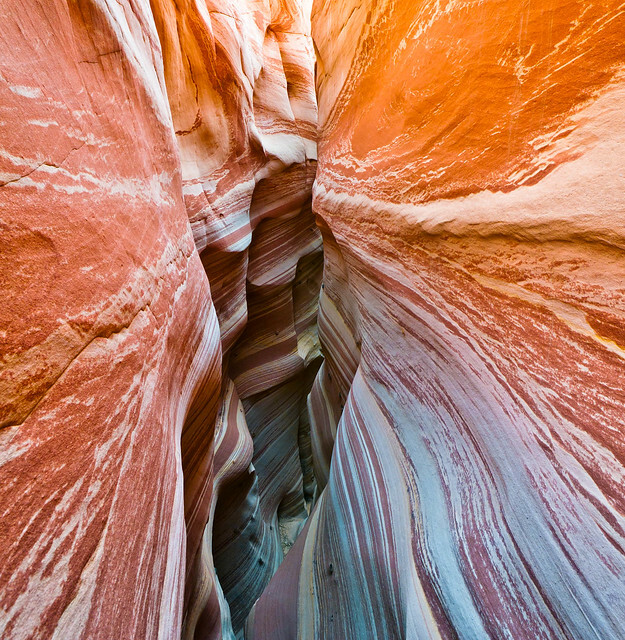 Our slot canyon photos are on Flickr. We also did a 3 day/2 night backpack into Coyote Gulch. 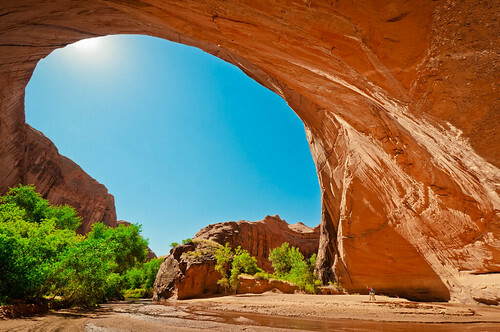 This canyon is notable for its huge alcoves and several arches and a natural bridge. We approached it by Hurricane Wash. There is also a shorter, more popular, access via the Red Well Trail that enters the gulch sooner offering more shade. But no, we took the longer, hotter trail in an effort to avoid more people (little did we know what was in store for us). 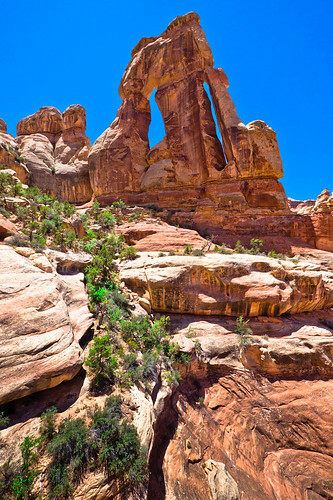 Our destination for the day was Jacob Hamblin Arch where we planned to camp for 2 nights. However, as we approached it we began hearing many loud voices. 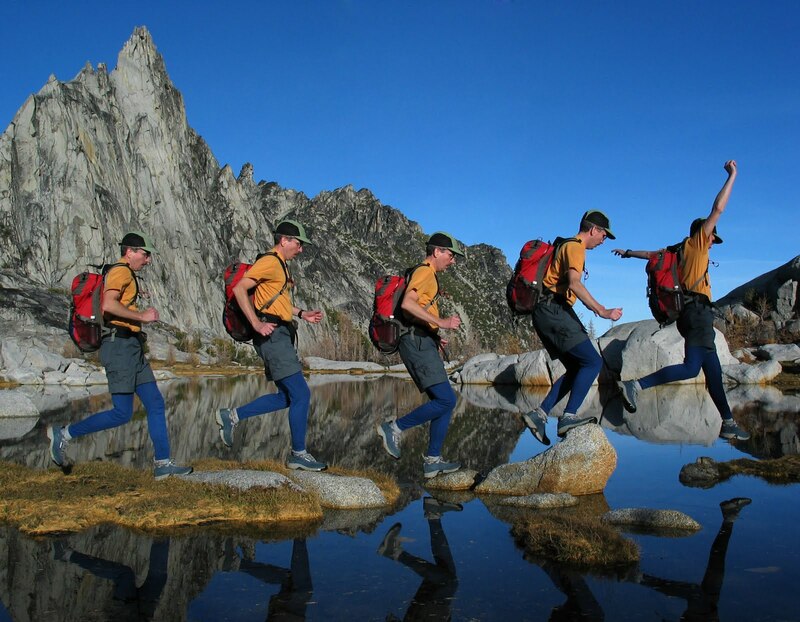 What we didn’t realize is that this is a very popular hike for Boy Scouts. During the three days we were in Coyote Gulch we encountered hundreds of scouts with their leaders (group size is supposed to be limited to 12 but there is apparently no limit as to how many groups can be there at one time). The acoustics of the many alcoves are so “good” that even a soft voice can carry a long distance. Of course it is unreasonable to expect so many young guys to be quiet when it is hot and there is water to play in but it really detracted from our wilderness experience. We moved back upstream and by going around several bends we were able to, for the most part, camp out of earshot of them. The next day we planned to hike downstream perhaps going as far as the Escalante River. The route crosses back and forth across Coyote Creek but this was not a problem as it was very hot. The creek passes under Coyote Natural Bridge. A fellow we encountered told us of a beautiful pool located off an unmarked side trail. But this was apparently no secret and this was a popular stopping place for many as well as a swimming hole for some. We hung out here for quite some time. 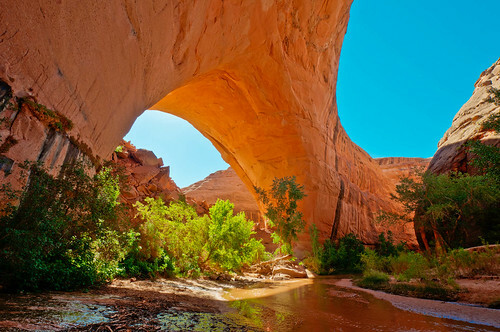 We had been warned that Coyote Gulch would be crowded but we didn’t realize just what that meant. In hindsight we should have hiked up Harris Wash which also has stunning alcoves but lacks the natural bridge and arches. 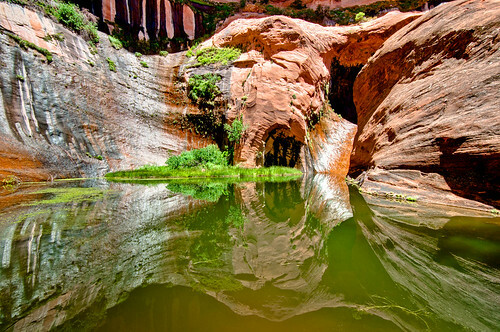 If you want to hike up Coyote Gulch be sure to find out when Utah public schools let out for the summer and go before! 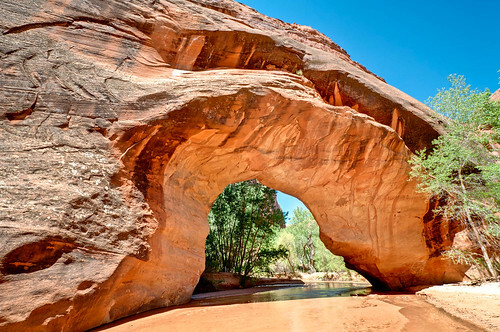 Our Coyote Gulch backpack trip photos are on Flickr. Our son Tom then came for a visit. We’d asked him what he wanted to do while he was with us but the only response was basically “anything as long as it isn’t delivering pizza (he works at Papa John’s Pizza). We decided to take him to some places he and Dan enjoyed when they were young and off school for Spring Break, Canyonlands National Park and Mesa Verde National Park. We chose not to do any backpacking while in Canyonlands, it was just too hot and there was very little, if any, water available. We did a day hike to Big Spring Canyon and Squaw Canyon, a seven and a half mile loop hike. We did another day hike to Elephant Canyon and Druid Arch, an 11 mile out and back hike. We had started very early so enjoyed a couple of hours of reasonable temperatures. But then it got hot, very hot. Both hikes involve some steep climbing over “slick rock” (which is quite grippy when dry) which seemed to suit Tom’s “unique” hiking style. Our Big Spring Canyon dayhike photos are on Flickr. ... no. He tolerated just one tour before saying “No more” and reminded us that he isn’t six years old anymore. Perhaps we should have taken him to Las Vegas instead. We will now head to Colorado in hopes enough snow has melted to enable us to begin doing some serious hiking at higher altitudes. 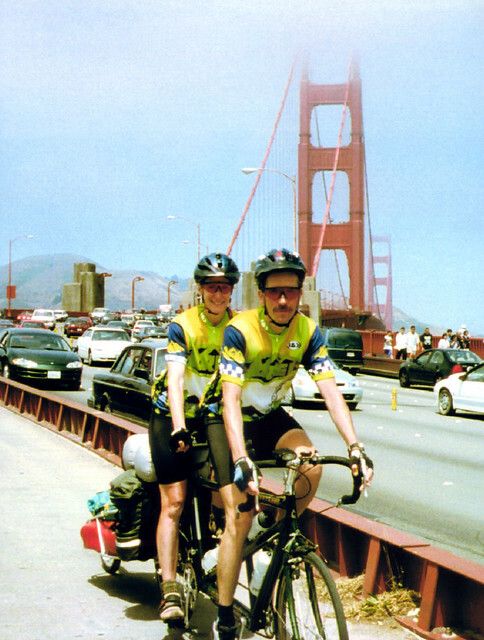 Back in 1999 when John and I were planning to ride our tandem bike the 1000 miles from Seattle to San Francisco John’s mom asked me “If you get too tired will you stop?” I assured her we would take rest breaks whenever we needed them but that wasn’t what she meant. She was asking if we got too tired would we stop the bike trip and go home. I don’t remember what I said to placate her but later on it got me thinking. What if? What if something goes wrong? What if I do just get too tired? 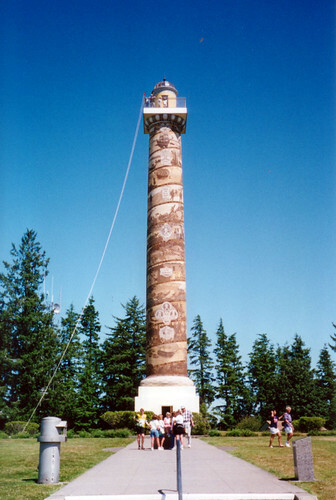 John insisted we visit the Astoria Column, located on the highest point in Astoria, Oregon. I could have done without the steep climb we had to make to get there. 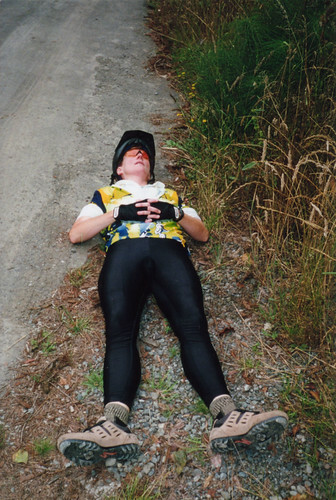 … and sometimes I did get really tired. I was beginning to panic. One of us simply had to get home no later than Monday Aug 16th. Because the next day my sister Laurel, who was staying with our boys while we were gone, and I were supposed to fly out to go to her home in South Carolina for a gathering of our family. Later that same day John’s mom was flying into Seattle from West Virginia for a visit. If we didn’t get home in time then my sister would have to stay with our kids and entertain John’s mom and Laurel’s husband would have been forced to cope with his eccentric in-laws in South Carolina. It would have been a mess. Of course in reality our situation was not so dire. Our route was well traveled by vehicles so we could have easily flagged someone down had we needed help and we had periodic access to telephones. Most importantly we had the financial resources and could have solved nearly any problem by throwing money at it. But the second week we stepped it up, averaging about 85 miles a day, and finished on Sunday Aug 15. Arriving in San Francisco on time! 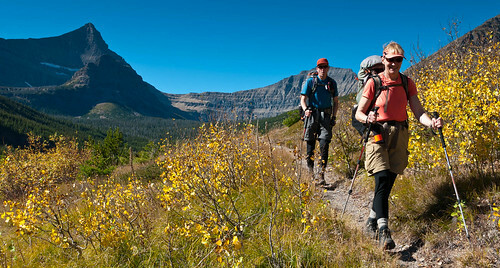 We haven’t ridden our tandem for quite awhile as we have been focusing on hiking and backpacking. We love to go into the backcountry and the more remote the area the better. This means that we can find ourselves out in the middle of nowhere with few, if any, other people around (and needless to say without cell phone service). 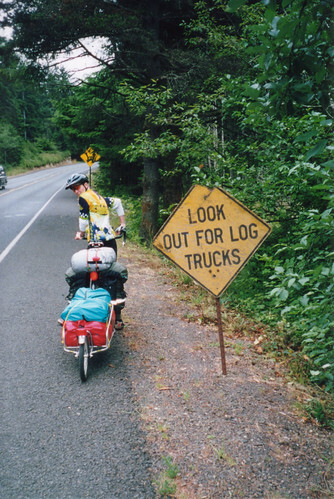 So unlike our bike trip if anything goes wrong we are entirely on our own. This makes me nervous because not even throwing money at a problem will do any good in the backcountry. For serious emergencies we do carry a Personal Locater Beacon to summons help if absolutely necessary but for anything less serious there is no way out except under our own power. With our John Muir Trail start date coming closer I find myself thinking. What if? What if something goes wrong? What if I just get too tired? John never shares my concerns or worries in challenging situations. He is more physically fit and has more confidence in his abilities. He also has far more experience with being physically challenged and successfully achieving his goals. 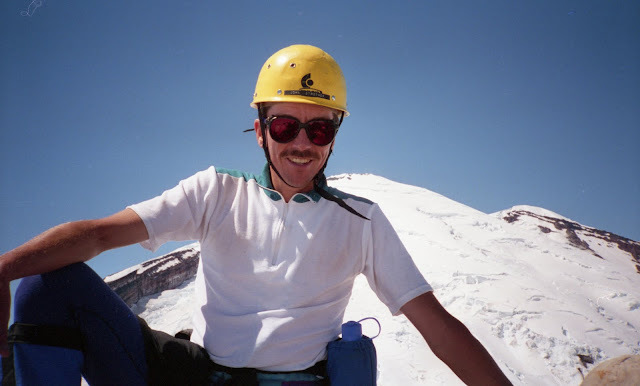 He has completed the Basic and Intermediate Climbing courses through the Seattle Mountaineers and has climbed many notable peaks in Washington State. 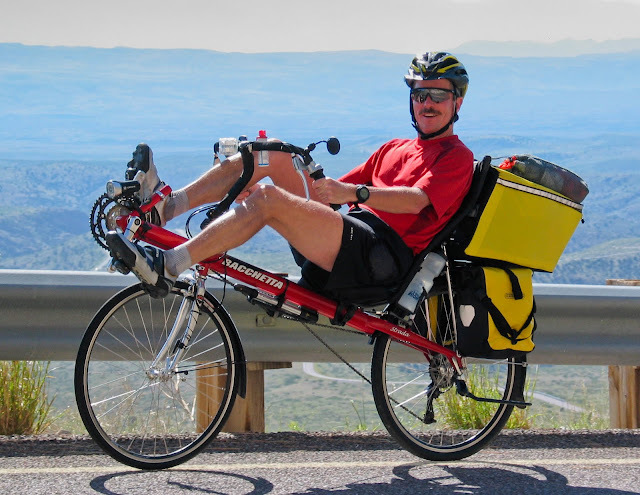 He’s ridden his bike across the southern US, a total of 3,090 miles. He’s an avid trail runner and has run the Wonderland Trail in Mt Rainier National Park in three days (on 2 separate occasions), a total of 93 miles with 22,000 ft of elevation gain, as well as the Northern Loop Trail (also in Mt Rainier National Park) in one day, a total of 40 miles with 8500 ft of elevation gain. Words like “can’t”, “give up”, “turn back” aren’t a regular part of his vocabulary like they are in mine. I just don’t have the experience and confidence that he does. 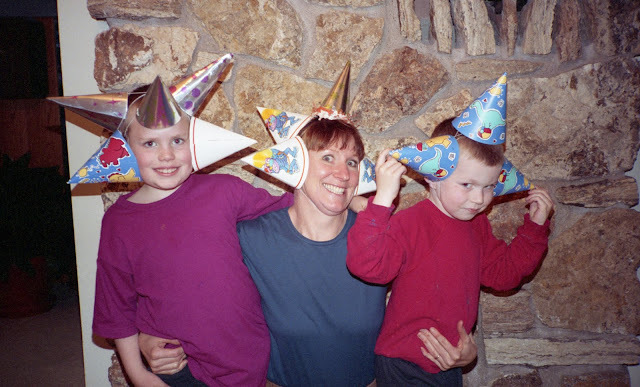 While he was off climbing mountains and running trails I was at home with our two boys. And then there are my feet. They are really screwed up; Morton’s Toes, bunions, hammer toes and a Plantar Fibroma. It’s a wonder they can carry me anywhere at all. Knowing my “interest” (i.e. obsession) with feet John suggested that I read Born to Run by Christopher McDougall. A major point the author makes is that wearing shoes, especially the well cushioned modern day running shoes, has enabled the muscles in our feet to become weak. And that modern day foot issues like bunions, hammer toes, flat feet and Plantar Fasciitis are the result. There is now a movement toward a more minimalist approach to footwear with the advent of 5 Fingers and Merrel Trail Glove shoes. There are also advocates for running barefoot. But then I recently remembered something that I overheard while I was standing on the summit of Mt Kilimanjaro. The tearful exclamation made by a young woman to her companion…“When I lost my leg a year ago I never thought I’d climb Kilimanjaro”. Her left leg had been amputated above the knee and she had hiked over 24 miles and gained more than 13,000 feet with a prosthesis. 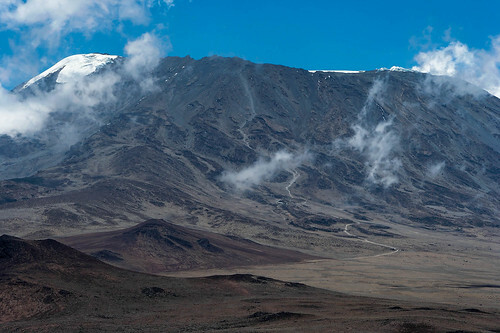 The final push up Kibo, the highest of Kilimanjaro’s 3 volcanoes, is the hardest part. It was a humbling experience then but remembering it now has inspired me. I’ve decided that if she could overcome the loss of a leg and put her mind to climbing Mt Kilimanjaro then the least I can do is NOT focus on what I might not be able to do. Instead I can be grateful for my two feet, screwed up as they are, that are attached to two whole legs, including the two bad knees. I can follow her example and help compensate for physical liabilities with mental toughness and determination. I can put my mind to keep putting one foot in front of the other. I can be confident that my feet will take me as far as I need to go. Most of all I can be grateful for how far they have already taken me (and get John to rub them occasionally). Good to see you're still on the go. Thanks, as usual, for bringing us along! Some gorgeous photos again, thanks for sharing! 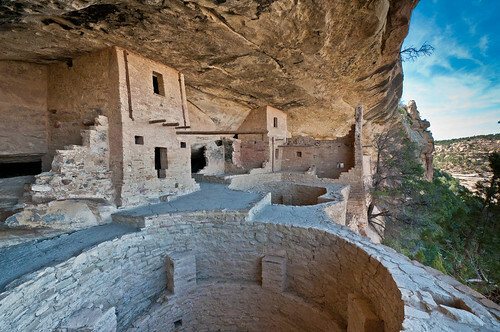 Wonderful post about some of the most beautiful places on earth. Thanks for sharing your experiences with us.